Production: Lenfilm (USSR); black and white, 35mm; running time: 97 minutes; length: 2600 meters or 8760 feet. Released 1934. Screenplay: Sergei Vasiliev and Georgi Vasiliev, from a published diary by Dmitri Furmanov detailing his experiences of the Russian Civil War of 1919; photography: A. Sigayev and A. Xenofontov; sound: A. Bekker; production designer: I. Makhlis; music: Gavrill Popov. Cast: Boris Babochkin ( Chapayev ); Boris Blinov ( Furmanov ); Varvara Myasnikova ( Anna ); Leomind Kmit ( Petka ); I. Pevtsov ( Colonel Borozdin ); Stepon Shkurat ( Potapov, a Cossack ); Nikolai Simonov ( Zhikhariev ); Boris Chirkov ( Peasant ); G. Vasiliev ( Lieutenant ); V. Volkov ( Yelan ). Vasiliev Brothers, Chapayev , Moscow, 1936. Vasiliev Brothers, Tchapaiev in Scénarios choisis du cinéma soviétique , Paris, 1951. Shumyatsky, Boris, A Cinema for the Millions , Moscow, 1935. Dolinski, I., Chapayev , USSR, 1945. Leyda, Jay, Kino: A History of the Russian and Soviet Film , London, 1960. Dickinson, Thorold, and Catherine de la Roche, Soviet Cinema , London, 1948, New York, 1972. Taylor, Richard, and Ian Christie, editors, The Film Factory: Russian and Soviet Cinema in Documents 1896–1939 , Cambridge, 1988. "The Whole Country is Watching Chapaev ," in Pravda (Moscow), 21 November 1934. Variety (New York), 22 January 1935. New Statesman and Nation (London), 2 February 1935. Seton, Marie, "New Trends in Soviet Cinema," in Cinema Quarterly (London), Spring 1935 and Summer 1935. MacDonald, Dwight, "Soviet Cinema 1930–1940," in Partisan Review (New Brunswick, New Jersey), Summer 1938 and Winter 1939. Montagu, Ivor, "The Soviet Film Industry," in Sight and Sound (London), Autumn 1941. Vas, Robert, "Sunflowers and Commissars," in Sight and Sound (London), Summer 1962. Helman, A., "Bracia Wasiliew albo ideologiczna interpretacja rzeczywistosci," in Kino (Warsaw), June 1973. Stábla, Z., in Film a Doba (Prague), January 1975.
" Chapayev Issue" of Kino (Moscow), July 1975. Ferro, Marc, "L'Idéologie du régime stalinien au travers d'un film Tchapaiev ," in La Sociologie de l'Art , (Paris), 1976. Schmulevitch, Eric, "Les Frères Vassiliev," in Avant-Scène du Cinéma (Paris), 1 and 15 January 1977. Uhse, B., " Tschapajew —Wir erlebten ihn wie unser eigenes Leben," in Film und Fernsehen (Berlin), July 1977. Sklovsky, Viktor, and others, "Chapayev—50," in Iskusstvo Kino (Moscow), November 1984. Dobrotvorskii, S., "Fil'm Chapayev: opyt strukturirovaniia total'nogo realizma," in Iskusstvo Kino (Moscow), no. 11, 1992. Dufour, D., "!Revolutie?" in Film en Televisie + Video (Brussels), no. 448, January 1995. "Etapy bol'shogo puti," in Iskusstvo Kino (Moscow), no. 5, 1996. 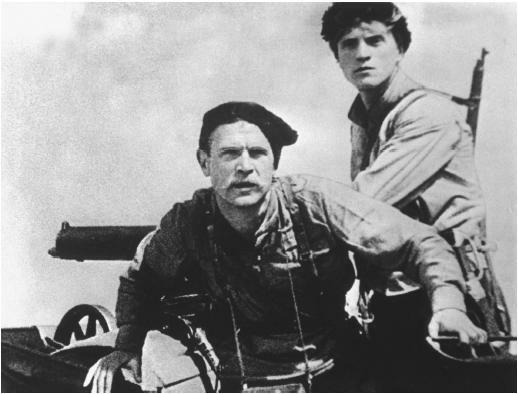 Navailh, F., "Le drapeau rouge et les gant blancs," in Cahiers de la Cinématheque (Perpignan, France), no. 67, December 1997. Chapayev was one of the most popular propaganda films of the Socialist Realist era, and is said to have been Joseph Stalin's favorite. As Stalin said in an address to the cinema industry in a letter in Soviet Cinema , "Soviet power expects from you new successes, new films glorifying, as did the Chapayev film, the greatness of the historical struggles for power by the workers and peasants of the Soviet Union, mobilising for the carrying out of new tasks, and calling to mind the achievements as well as the difficulties of socialist construction." The Brothers Vasiliev was the name chosen by the unrelated filmmakers Georgi Vasiliev (1899–1946) and Sergei Vasiliev (1900–1959), contemporaries of the great creators of the Soviet silent cinema. They met and became friends in Moscow in a Sovkino laboratory where foreign films were recut and re-edited. Later they trained together at the studio of Sergei Eisenstein, the most renowned of the Russian Formalist filmmakers and theorists. Chapayev is based upon a novel by the same name published in 1923 about communist writer and Red Army commissar Dimitry Furmanov who fought under the heroic divisional commander Chapayev against White Troops at the Eastern Front during the 1919 battles in Turkistan. The story revolves around the relationship which develops between the two when Furmanov is "sent from the center" to Chapayev's troops, who have preserved guerrilla tactics and follow their commander with unequivocal allegiance. Their initial confrontations grow into genuine attachment as Chapayev's attitude toward the new leader of his division changes. Furmanov, though younger than Chapayev, has a refined nature and wisdom which complements his fearless elder, who, despite the fact he only learned to read and write two years earlier, is a natural leader and strategist. At the heart of Chapayev is the idea of the role of the Communist Party in directing the establishment of the Red Army. As Naya Zorkaya argues in The Illustrated History of Soviet Cinema , "It found expression in the Chapayev-Furmanov confrontation, in other words, a clash between spontaneous revolutionary fervor and the purposeful, organizing, and guiding will of the Party." A Pravda editorial, "The Whole Country Is Watching Chapayev ," which appeared at the time of the release of the film, celebrates its propagandistic features: "We are indebted to the mastery of the Vasiliev brothers and the whole collective of artists employed in the film Chapayev for a magical return to those days when the Revolution had only just won a chance to build a new life on earth." The political powers in this era tolerated nothing antithetical to the goals of the Communist Party so that artists and critics alike were bound to the tenets of communism, hence the sycophantic tone of many of the reviews of Chapayev , which were mindful of Stalin's watchful eye. Chapayev is an example of a piece of art which represents the Socialist Realist style endorsed by the communist government to orient the masses and encourage compliance with the goals of the new political regime. The code of Socialist Realism included "the ability to view the past from the height of the lofty objectives of the future," so the aims of the films were to enhance the Communists' prestige and to affirm the party's leading role in all spheres of Soviet life. The film was seen by the masses and Chapayev became the common person's hero. Despite its function as propaganda, Chapayev is a work of quality. The artistry is evident in the honest representation of human failings, even in the Bolshevik camp, and in the performances and the oneiric beauty of the images. The pace of Chapayev may seem to stall due to the relatively slow cutting, few suggestive details and routinely mechanical camera angles, but these features contribute to the type of realism the Vasilievs chose to represent. The national hero, rugged and flawed, is the focus and the story which is told through dialogue and a linear narrative, a style in contrast to Formalism which collided images through montage and fast-paced editing. Eisenstein wrote that kino pravda (film truth) is achieved by allowing the camera to capture pure images of the world and that dialectical montage, the collision of images through editing, communicated ideas with the viewer as active participants rather than as passive receivers of the cinematic narrative. But the story of Chapayev is told with simplicity. Boris Shumyatsky in an extract, A Cinema for the Millions (1935), stated that "This simplicity, which is a characteristic only of high art, is so organic to Chapayev , it constitutes such a striking contrast to every Formalist device that in the first period after the film's release a number of "critics" were unable to explain the reasons for its success to their own satisfaction. . . The strength of Chapayev lies in the profound vital truth of the film." Chapayev is truthful because it captures the spirit of the time and the struggle of the Soviet populace toward an ideal they needed to believe was worth the destruction of war. Its truthfulness is only called into question in retrospect as time revealed the transience of communist ideals. Where can I acquire a DVD of this remarkable film?? ?